River & Post is a culinary driven restaurant in a warm, modern setting where we strive to captivate our guests with quality ingredients, impeccable service and memorable accommodations for any occasion. River and Post opened its doors on November 20, 2017. You'll come for the view, but you'll come back for the flavor. At the corner of Riverside Avenue & Post Street, you'll find an exciting new restaurant concept with a rooftop lounge overlooking downtown Jacksonville that offers a view straight down the gorgeous St. Johns River, past the neon glow of the stadium and on up to Dames Point. You'll enjoy an atmosphere like no other and a culinary experience that will make you, well, yell from the rooftops. While our journey HAS just begUN, we're excited to share our story and we look forward to serving and being part of the Jacksonville community for years to come. With a restaurant perched high atop a prominent Riverside building, the team behind River & Post took a commanding view of Jacksonville’s landscape and entered the city’s culinary scene with a delectable seafood-forward menu and easily the best rooftop view in town. 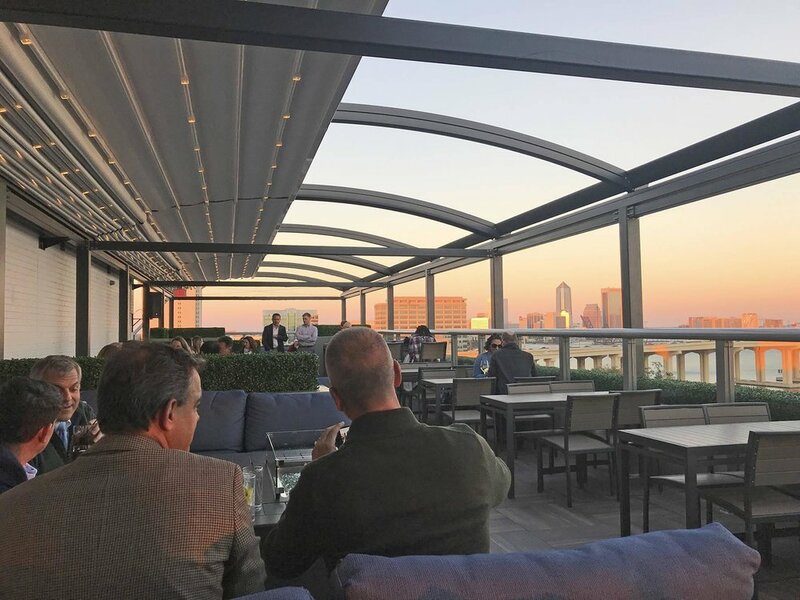 While the 450-seat restaurant offers great food, atmosphere and cocktails, the rooftop lounge offers some of the most unique cocktails in town that are handcrafted nightly for guests. If you are trying to make a reservation, please call us at 904-575-2366 or utilize the OpenTable app above under the RESERVATIONS tab. If you're an experienced hospitality industry veteran, we want to hear from you now! Please click the button below to send us an email with an attached resume for us to review.